FeSe is a high-temperature superconductor displaying a complex interplay between structure, magnetism and superconductivity; new theoretical results might now shed light on its pairing mechanism. FeSe is widely studied because its superconducting critical temperature can be tuned over a wide range by chemical intercalation or pressure. Superconductivity appears in a phase that is called nematic, which breaks rotational symmetry but preserves translational symmetry. 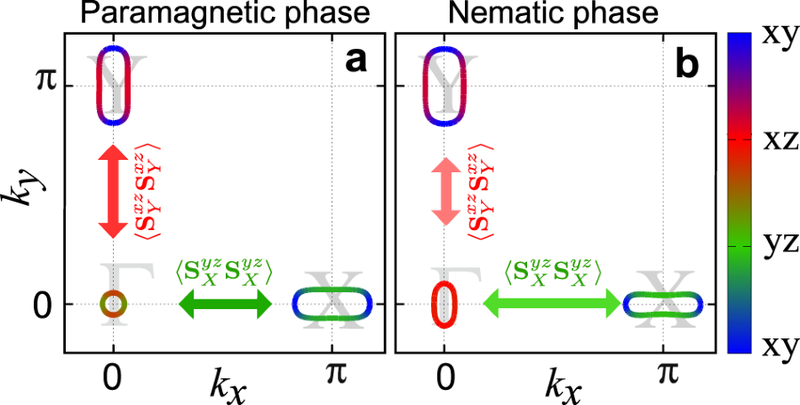 Experimental measurements show that the superconducting gaps are anisotropic: this is probably related to the nematic transition, in which spin fluctuations seem to play a part. Laura Fanfarillo from the International School for Advanced Studies (SISSA) and colleagues present a model suggesting that orbital-selective spin fluctuations provide the pairing mechanism, which is at the same time orbital selective and nematic. This explains both the anisotropy of the gaps and its connection to the nematic transition.